The Magic Lasso | Capturing great books. One at a time. The Clothes on Their Backs is the Orange- and Booker-nominated book by Linda Grant – and it’s certainly worthy of its accolades. Set in London during the 1970’s, it’s an enthralling look at family relationships, war and growing up in the shadow of family secrets. Vivien Kovacs is the daughter of her reclusive, refugee parents, who emigrated from Hungary to London during World War II. Vivien’s parents shielded her from life’s experiences, including a complete avoidance of Vivien’s uncle Sandor, who also lived in England after the war. Once Vivien graduated from college, she became more and more curious about her mysterious uncle, who had served time in prison for being a “slum lord.” She finally got an opportunity to meet him and forged a relationship with her uncle, despite her father’s wishes. I can’t say Vivien was the most likable character, but she was very believable. She was flawed and human, like her uncle. I was most intrigued, though, by Vivien’s mother, Berta. She was a minor character in the book, but Grant left enough of a breadcrumb trail to make you wonder more about her. I think there was more there than met the eye. Hi Magic Lasso friends: My apologies for being absent from my blog. Life sometimes gets in the way, despite my desire that it not. Please excuse this post jammed with three mini-reviews. Hopefully, I will get back on track with my book reviews. Sandcastle Girls is Chris Bohjalian’s latest book and probably his most passionate, emotional book to date. Inspired by his family’s history, Sandcastle Girls follows young Laura Petrosian in modern day and Elizabeth Endicott, a young woman who travels to Syria to assist Armenian refugees in the early twentieth century. Through these women’s stories, the reader learns a great deal about the Armenian genocide that occurred around World War I. In her latest book, Debra Dean explores the world of St. Xenia, a Russian saint who was known for her gifts to the poor, through a fictional account told by Xenia’s cousin. Xenia was a selfless soul throughout her life. She met her husband and eventually had a daughter, but tragedy struck Xenia, leaving her grief-stricken. Seeking solace, she began to give away her money and items of wealth to the poor. Xenia also had a keen sense of the future, often predicting how people would die. Between her charity and soothsaying, Xenia became revered by the poor but a threat to the crown (specifically Catherine the Great). I received an advanced reader’s edition of this book from the publisher for review on my blog. Playing With Matches is a story in two parts. The first part is about the childhood of Clea Shine, a precocious white girl living with a black “aunt” who takes care of her because Clea’s mother, a prostitute, refuses to do so. The second half of the book is about Clea as an adult – herself a mother – running from her cheating husband and her past. And the winner of Bring Up The Bodies is…. Congratulations! Please email me your mailing address: mrstreme@gmail.com. Thanks to everyone for participating in Orange July! I hope you had fun! Orange Connection: Just published – perhaps a 2013 contender? 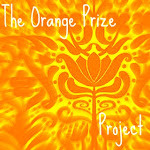 Your activity: I predict Bring Up The Bodies will make the Orange Prize Short List next year, if not win the whole thing! Have you read any books this year that you think will get nominated for the 2013 prize? Let us know in the comments below. Reminders: Orange July giveaways are open to all Orange July participants (you must be signed up through this Mr. Linky page), is open to anyone around the world, and you can win more than one giveaway. You’re welcome to participate in any giveaway activities without being entered into the drawing; just let me know in your comments. Giveaway closes at 9pm Eastern. Have fun! And the winner of Eveless Eden is…. Congratulations! I already have neer’s address, so I will make sure to send this book out soon. LOVE everyone’s answers! I hope you one day get to visit your dream spots! Your activity: You just won a fake trip to any place in the world! How awesome! Where would you go, and what Orange book(s) would you throw in your suitcase (or upload to your e-reader)? Congratulations! I already have Ally’s address, so I will be sending this book to her soon. Your activity: When I read The Night Circus, I kept thinking how it would make a good movie. Have you ever read a book and hoped it would be adapted to film? What is your favorite book-to-movie adaptation? Tell us in the comments below! I love watching the Olympics too. I am a sucker for a good race and a come-from-behind victory. Enjoy the Olympics! Your activity: Yay, the Summer Olympics have started! Do you watch the Olympics? What is your favorite sport(s) to watch? Tell us in the comments below!